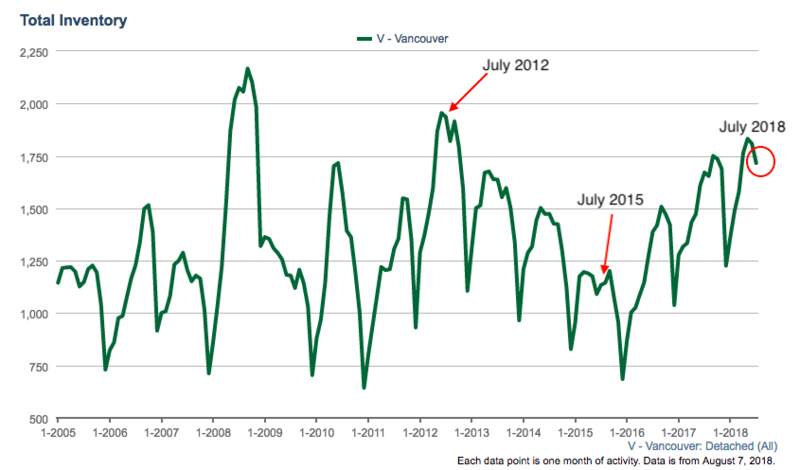 The downturn in Vancouver’s detached market continues to be the most obvious of all property types. Once again sales churned in at all time lows this month. July witnessed just 126 house sales, the lowest total on record, surpassing a previous low of 193 sales set in July of 2012. Despite limited public data, it doesn’t take an astute investor to figure out something isn’t quite right. Detached sales sunk an eye watering 50% below the ten year average for the month of July. To no surprise, this has solved the mysterious supply issue. Nearly two years of weak home sales has allowed inventory to play catch-up. Inventory for the month of July increased 2% year-over-year and sits at the highest level for the month since July of 2012. Buyers have plenty of options and are clearly in the drivers seat. While many sellers are reluctant to cut their price, the ones that need to sell are having to take hefty reductions. This ultimately sets the neighbourhood benchmark lower as future buyers will look at the most recent sales to determine fair market value moving forward. Vancouver detached inventory for sale. 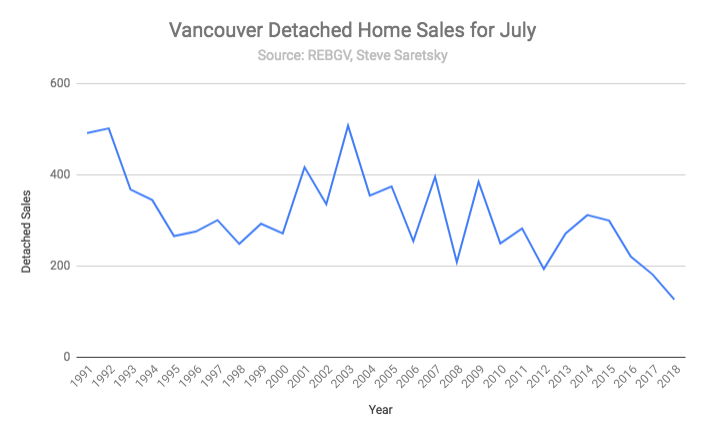 This is beginning to reflect in the data and although sales mix can distort both average and median sales prices from month to month, the trend is clear. In July, the average sales price declined 16% year-over-year. The median sales price slipped 3% year-over-year. It’s worth noting the median sales price in May registered a 12% decline year- over-year, so you can see how average and median can fluctuate rather drastically. Overall, it’s a safe bet to suggest the typical home is off about 15% from the peak. 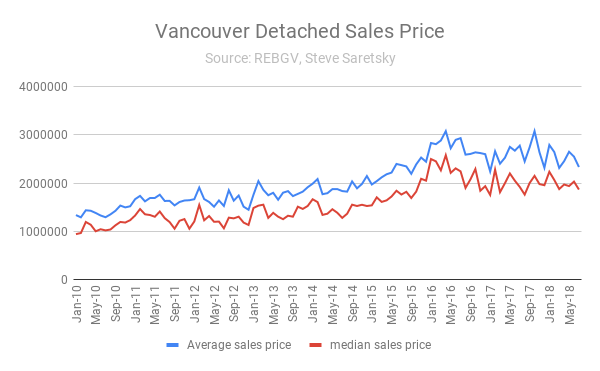 Vancouver detached average and median sales price. Frustrated sellers are frequently removing their listing from the MLS in hopes that market conditions will shift in the months ahead. So far that strategy hasn’t worked out, with prices steadily moving lower. However, if new listings continue to dwindle, down 24% from a year ago, perhaps that can provide some relief to burgeoning inventory levels.